Awhile back, I wanted to try my hand at creating a Mahjongg game. This game is the result of this work. 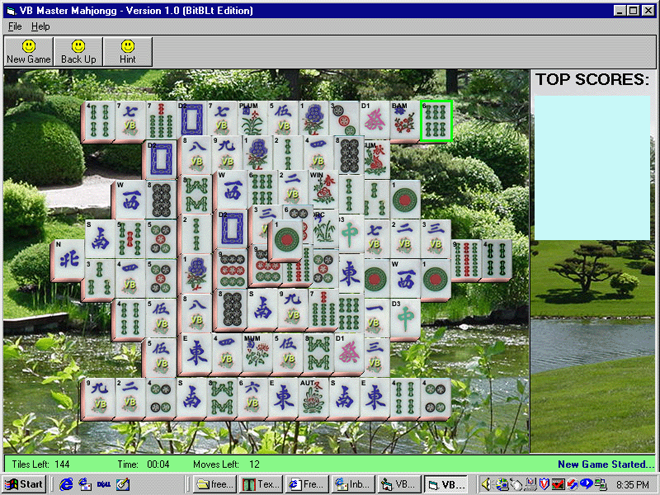 It is a basic solitaire Mahjongg game with no special frills. Just one basic tile set and one classic tile layout. This is a Microsoft Windows based game. Here are the features that are included. Easy installation with the installer. Can give hints to legal moves. You can take moves back. Keeps track of best times. Displays number of moves left. Has some cool sound effects like the clicking of tiles and a chimes effect when a game starts. Has Japanese garden background scenery. The game looks best in a screen resolution of 800×600. If you run the game at a higher resolution (which is likely) the game will appear in the upper left of the screen but still be completely fun and functional. The game is provided as-is. I find it very playable and have played it lots of times myself. SetupVBMahjongg.zip (3,800,736 bytes) zip file contains the exe file. As a programmer, are you interested in seeing how I wrote the code? Go to this page to find out more about the program and to download the source code for free. I hope to provide more information about the code in the near future. For years I have played your game sometimes for hours everyday. Unfortunately I had to buy a new pc and it is 64 bit and now the program is not compatible. It can’t be installed. Would there be anyway that I can get a copy that will be compatible? SDP: Sorry for getting back to you so late. I have no plans on writing a 64 bit version. You might want to go to this link: http://msdn.microsoft.com/en-us/library/aa384249%28v=vs.85%29.aspx which gives information on running 32 bit programs on 64 bit Windows. thanks for such generosity… may it come back to you a thousand-fold. I had fun playing, but am too stupid to know how to keep the game.. Maybe an icon will magically appear on my start menu – or not. Not sure if i will navigate my way back here, in the event that i can’t, just thought to thank you now.